Competition was fierce between corps on the West Coast this past weekend, despite Sunday storms in Mesa, Ariz. forcing the corps into standstill performance mode. Inclement weather aside, it was no doubt another entertaining Friday and Saturday, with a major step up from the Academy and back-and-forth tussles among the Open Class competitors. The Academy pulled ahead of the pack of remaining World Class corps on the West Coast during Saturday's So-Cal Classic while passing the 80-point milestone. Following the Tempe corps was Pacific Crest, who built on its previous showing with a 75.900. The Mandarins also made improvements, holding onto their position and scoring a 74.700. And the Cascades are continuing to separate themselves from last year's corps, scoring a 72.700. But perhaps the most excitement this past weekend was created by Open Class rivals Santa Clara Vanguard Cadets and the Blue Devils B. The Vanguard Cadets ended Blue Devils B's undefeated streak (which stretched all the way back to June 26, 2009) in Paramount, California scoring an 86.500 to BDB's 86.000. Director Robert Nieves said the season has been "absolutely phenomenal" for SCV. "The corps has worked so hard, and they have worked so smart," Nieves said. "We haven't had to talk about having more energy — they go out there and they've got that energy. They've shown up for every show. These kids love to perform." It was the last opportunity for the Vanguard Cadets to compete against Blue Devils B, as the corps will not travel to the Open Class World Championships this year. 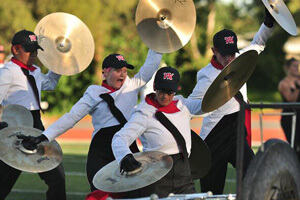 Nieves said members had hoped to be "neck and neck" with their closest competitor before the two corps parted ways for the rest of the season, and the Vanguard Cadets achieved that goal. "Of course this is a competitive activity, and scores are a given," Nieves said. "[But] that Saturday show before we saw any scores, the kids walked off that field knowing that it was their best show so far to date." Another interesting development was the back-and-forth movement in the standings between Gold and Impulse. Although Gold has stayed ahead for most of the season, Impulse shook things up Friday at the Dream Invitational, in Corona, Calif. by passing the Hawthorne, Calif. corps. But the two friendly competitors switched again Saturday, with Gold regaining the lead at the So-Cal Classic.. Thunder did not compete in Corona, Calif. on Friday, but on Saturday the corps made big strides and ended the weekend with a score of 74.000. This Pacific Northwest corps stands a little over two points behind Impulse, making the battle between the current leaders that much more exciting. Velvet Knights jumped up more than two points from the Corona, Calif. show, and this Friday, the corps departs for its national tour. "Our season has been fantastic," said Director Mayra Iraheta. "There are ups and downs all the time as in every corps. But we just take one day at a time and keep pushing forward." City Sound, a new Open Class corps from Long Beach, Calif., had a good showing Saturday as members performed their fourth and final show of the season. With just one performance remaining, a parade in August, corps director Nathaniel Lewis said members are "trying to figure out what to do with the rest of their summer." Next year, the corps hopes to participate in more local shows to give members additional performance opportunities. "We did very well for the first year," Lewis said. 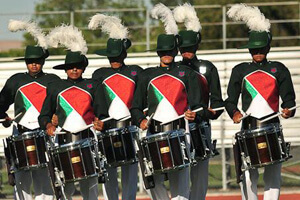 "It was just a matter of getting out there and getting the kids' act elevated to drum corps. A lot of [members] had only seen drum corps on the Internet or on TV. So at the first show, they kind of freaked out. But this past weekend it was a totally different group of kids: more confident, more hungry. They were chomping at the bit, wanting to go out there and perform." 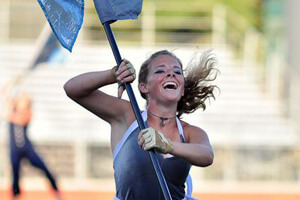 The always-entertaining Blue Devils C finished the weekend with a 56.800, holding steady from the Corona, Calif. event. And in the All-Age category, the Renegades of San Francisco took the top spot, improving Saturday by about 1.5 points. SoCal Dream of Fountain Valley, Calif., increased its score by nearly three points from Friday to Saturday. View scores from July, 16 in Corona, Calif. View scores from July, 17 in Paramount, Calif. Photos courtesy Chris Maher, corpsreps.com.